So, here’s the recipe instead. Make it for your next potluck and shock your friends. 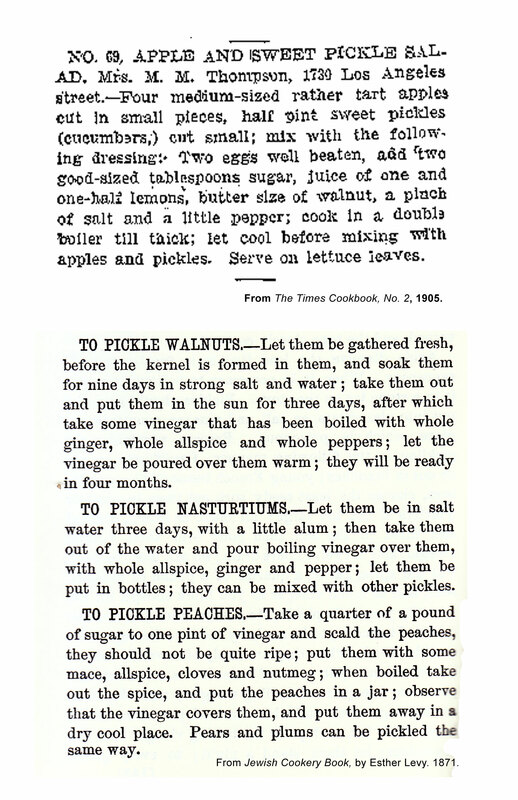 I’ve also included a few cool pickling recipes from the first Kosher cookbook to be published in America, Jewish Cookery Book (1871). If anyone gives those a try, I’d love to hear about it. The pickled peaches sound delish. Yumm Pickles…. The eggs are what sound the strangest in the apple and pickle recipe. I have made pickled grapes with the a recipe very like the pickled peaches recipe and they came out really interesting. The main thing was to use Apple Cider Vinegar instead of While Vinegar. I’ve make pickled peaches, cantaloupe, and watermelon rind. They tasted good in progress; I haven’t opened up any jars yet. The vinegar fumes were pretty potent during cooking, as I recall. One tip I got from an older lady was to use clove oil instead of cloves to keep the finished product from discoloring.